In the 1940s, DeGrazia had little success finding a gallery to represent him, so he decided to take matters into his own hands. 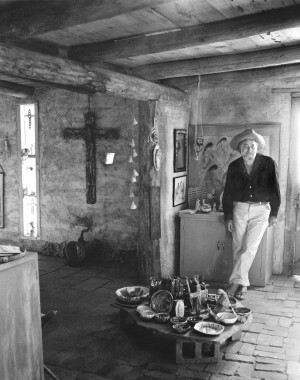 First he built a studio at the corner of Prince Road and Campbell Avenue in Tucson, but as the city grew around him, he and his wife Marion bought 10 isolated acres in the foothills of the Santa Catalina Mountains and built a mission, home and a small adjoining gallery to exhibit his originals. The prolific artist soon needed more space to house his continuing output of originals. As his fame and finances flourished, he designed and built a larger adobe gallery on the site and moved his growing collections out of what is now known as the Little Gallery at DeGrazia Gallery in the Sun. Knowing firsthand the difficulty that lesser known artists have in finding a venue to display their work, Marion reopened the Little Gallery to visiting artists after her husband’s death. Today the DeGrazia Foundation continues this legacy during the winter months. For more information about exhibiting visit here. Applications are available online for two weeks in February. Artists wishing to show their work in the Little Gallery are asked to send examples of their work to the DeGrazia Foundation, with attention: Lisa Palmer. 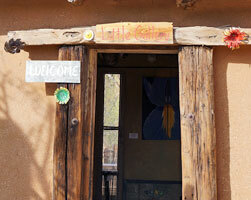 Upon acceptance, artists in all mediums are given space to showcase their work for two weeks. Exhibiting artists are responsible for installing and promoting their exhibitions. Artists must also staff their exhibit during gallery hours to answer visitor questions. Artists who have exhibited at the Little Gallery within the past five seasons are not eligible to reapply at this time.